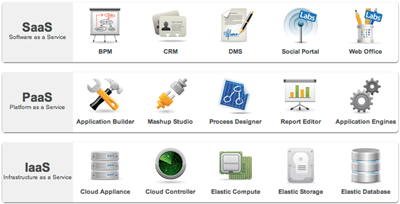 provides an integrated portfolio of applications for cloud computing. Our products can be deployed on premises for maximum security and control, or on public clouds such as AWS. Applications developed with Intalio|Cloud are elastic and multi-tenant, automatically. I’d not heard from Ghalimi for a couple of years, since the 2008 Office 2.0 conference (an event which is, sadly, no longer). He’s always had a very holistic vision for office 2.0 and was excited to say that the latest offering from Intalio realizes that vision. So what does this actually mean in terms of a product lineup? Ghalimi referred me to the diagram below. Now this diagram looks very much like a million other diagrams out there that explain what Cloud Computing is – separating the different levels of the stack into IaaS, PaaS and SaaS. Nothing revolutionary in that you say? That is until you realize that this isn’t an ecosystem diagram, rather this is a diagram of the breadth of offering available from Intalio themselves. Think of our offering as an operating system for the cloud. Much like Windows, it needs to provide some core services (compute, storage, database) and development tools. And without a killer application (Office for Windows, CRM for us), it would be kinda useless, or at the very least much harder to use. On the PaaS level, Intalio has been built using the same structure as Salesforce’s AppExchange. Becuase of this, AppExchange applications can be run on Intalio using whatever delivery method the customer likes – private, public or virtual cloud and single or multi tenant. With a caveat that, in his understanding, Zoho is available for private cloud “if the organization is big enough”. Intalio is entirely agnostic in terms of delivery method – it can be run on public, private or hybrid clouds and has the ability to be either single or multi-tenanted to meet the demands of all use cases. It’s an interesting play and mirrors (at least to a certain extent) the direction taken by salesforce.com who started off firmly at the SaaS level (with the salesforce app) moved down to PaaS (force.com) and has recently moved further down the stack into IaaS (VMForce). The vast difference between salesforce and Intalio is that the former is a billion dollar business with thousands of employees and significant traction in the enterprise. They can leverage this traction to gain business at other levels in the stack. Intalio, by contrast, despite having been around for years is very much still in startup mode and, despite some impressive customer names on the front page of their site (Zimbra, Finnair and Facebook among others) are something of an unknown. It’s an eminently logical approach – tie all levels of the stack into one offering and give customers the options in terms of delivery. It is however hard to see how a small player like Intalio can pull it off, and it’s unlikely that Intalio would be much of an acquisition target, there’s very few vendors out there who don’t have a serious product overlap with Intalio. Whose challenge is this ? Marketing team is coming up with innovative price plans, Sales is aggressive in acquiring customers, Technical team is provisioning services, Customer is availing every option of service extensively but end of the month, usage metering , calculation and invoicing !…..How do we do this? Is this a concern for every cloud computing provider ? To have competitive edge and sustain in the cloud market place, cloud service providers are flexible in terms of their services, price plans or pricing structure which introduced the concept of Pay Per Use (PPU). But, one must not ignore the pains of a cloud service provider in tracking, collating and calculating the usage of each and every customer, applying respective rate plan, and generating a bill. In addition to the usage based pricing parameters such as storage space, bandwidth consumption, computing cycles, number of users, modules, services, instances, downloads, alerts, hours etc, every cloud service provider has its own vertical specific usage based pricing charges e.g. in SaaS HRM vertical , they charge based on number of employees, or per month per user, Now the challenge here is cloud service provider has to have a continuous watch on the usage consumption of its customer(s) which may prevent from significant revenue loss. Alerting and allowing a customer on the usage limit (threshold) is again one such crucial business process. Cloud service provider follow a manual process or they have a tool in house developed to track such things. This exercise involves additional human resource or efforts to their operations . Manual usage tracking is not much of a painful process for start-ups with less customers. However usage tracking process would become a challenging and painful process for the service providers with Large customer base. Hence cloud service provider should automate its usage tracking process and keep a weather eye on the individual customer’s usage consumption. This will reduce the revenue loss occurred in manual process. eVapt has proven experience in collecting the usage records for cloud subscription service providers across the globe. eVapt has deployed its solution along with it’s Metering module which integrates with cloud service providers database servers / control panel /virtualization platform to collect the usage detailed records (UDRs). This will collect data that is in logfiles, databases or can run scripts written in Java to collect data. The Metering component in eVapt allows collections of multiple usage type and accurate processing of the same. This will plug the loss of revenues through accurate usage collection and processing.